Nintendo of America has a new Vice President of Sales with a name that will be instantly familiar with fans of Mario. Before you get your hopes up, it's not who you think. 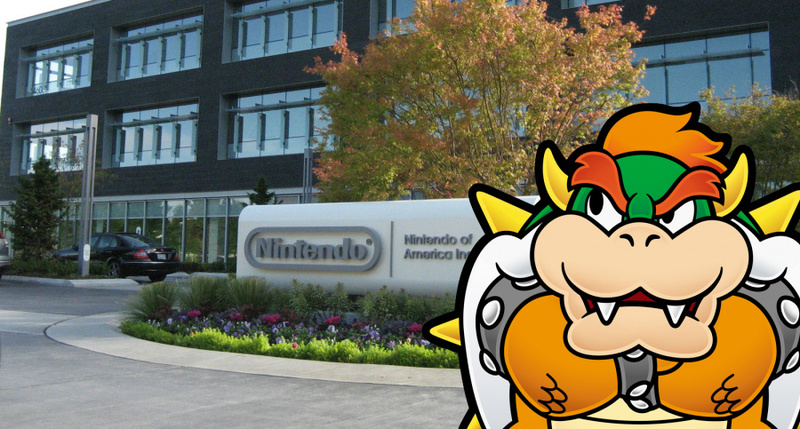 Doug Bowser - not that Bowser - joins Nintendo from Electronic Arts, where he was employed as Vice President of Global Business Planning. He will report to Scott Moffitt, Nintendo of America's Executive Vice President of Sales & Marketing. Nintendo of America has hired a new Vice President to lead the United States sales organization with a name that's well-known in the Mushroom Kingdom. Effective today, Doug Bowser (no relation to the King Koopa and Mario's longtime nemesis) will oversee a variety of sales-related functions, including Sales, In-store Merchandising, Retail Strategy and Retail Marketing. While part of us wants to believe that Nintendo of America only hired Bowser so it could make a joke about it, it would appear that Doug has a pretty solid track record. As well as working at EA, he was previously employed by Procter & Gamble and has a bachelor's degree in communications from the University of Utah. Welcome to the team, Doug! We hope you're ready for hearing that same joke a million times every day. What a coincidence! I wonder if the name had something to do with it. I have a feeling he may be popping up in some of Reggie's groan-worthy announcement skits. Maybe they'll finally give Bowser his own game and let Doug announce it! lol, such a fitting name! Let's see if he brings over some smaller N3DS with the face plates. Wow...does that mean that all of the people working under him are going to be known as his Kooplings? Talk about a self fulfilling prophesy. A BA in comm from U of UT? Swoon! @NintyMan Sure, but tell me it doesn't sound like a Nintendo skit to be talking about some new Mario game and when someone mentions Bowser, Reggie goes, "Wait... where IS Bowser?" Then we see Reggie, Bill and a couple guys in suits step into an office as the camera slowly pans up a desk to show the "Doug Bowser" nameplate and a piece of paper on the desk reading "Gone to lunch." Everyone looks shocked and it starts an elaborate wild goose chase ending with Doug nomming on a sandwhich in the office cafeteria saying, "What?" Then a trailer starts for Super Bowser Buffet, a new eShop game in which you control Bowser to traverse labrynthine restaurants and candy factories, eating everything in sight and fighting giant bosses who want to eat the food that's rightfully yours. I hope Doug Bowser manages to fix the Amiibo stock problems, so I can get my Shulk. Bowser worked for EA and P&G. Take Your Children to Work Day will be a nightmare. Well what a coincidence. Hopefully doug can make the amiibo problems and n3ds come to america. That name actually worries me. No, not the Bowser name . . . Electronic Arts. Please don't bring any of EA's policies, horrible business models, or ideas over. I read the photo caption and thought they hired this guy. Might have been good in a Splatoon commercial, "Get a Job" kind of sounds like - splat splat splat splat splat Spatoon. The fact his surname is the same name as the arch-nemesis to Nintendo's mascot doesn't help either. @Linkmeister You do realize that Nintendo of Japan controls the software, right? NoA just localizes and develops a few of them. Mr. Bowser (hehe) would have no control over that. Welcome to Nintendo Mr. Bowser, please do not bring EA's micro transactions practice to the company. Thank you. Wait....if he's from EA, would he actually encourage NoA to make the next Fire Emblem game as two separate games along with Microtransactions? I'm sure since he became aware of the real Bowser he has imagined himself one day working for Nintendo or at least amused himself at the thought of it,especially once he started working for EA. Funny name but have to say like others I'm a bit concerned about the EA part. Would this include the time EA was twice voted worst company in america? The whole ME3 vs ME trilogy debacle? The constant whining about the wiiU? In other news, amount of Bowser's related paraphernalia skyrockets. "including Sales, In-store Merchandising, Retail Strategy and Retail Marketing."? I'm with the rest of the people that don't like EAs... way of business, but I hope this at least brings some change to the amiibo situation and other problems with Nintendo's lack of sufficient retail attention, since this sounds like the type of field he'll be dealing with. I'm sure he's not high up enough to impose micro transactions of any sort (Nintendo of America doesn't make most of the games. If there are micro transactions on a major level, they would likely first be implemented by the developers in Japan, America has less say) , and Nintendo would never allow it to get near as bad as EA and other companies have it. I doubt this guy at all has enough power to do any of the EA reflecting things we'd worry about. I'd chill out guys. Doug Bowser has been director of sales since 1984 at P&G. While at this company that sells pet foods, cleaning agents, and personal care products. Also P&G originally was an food company that gave us "PRINGLES" but now that is owned by Kelloggs ( like the corn flakes. This is an company based on Ohio folks. Ohio??? Is there anything good about this person who studied in Utah??? What is his advantage. The way I see this person is that HE IS RETIRED and is enjoying being inside an company who product is equal to an addiction and an toy at Christmas. He is not an runner up, or an go-getter. Just an guy who most likely took business and had somebody to guide him down the right path. He is retired ( logically ). He was retired before he had started back in 1984. I really do not care about this persons name but to point out the fact that for the most part of his career was at an "Potato Chip" company that is now selling non-food products. I just want to point that out people. EA is and has also been nobody friend as well. Remember what EA did to SEGA Dreamcast after SEGA sided with NEC. However EA back on the Genesis was an under-dog player in videogames and thus was something to proud of. EA recently blocked off other companies from making videogames featuring real sports-teams and names. Which pretty much damage every-bodies ability to make sports games with real names or features. "including Sales, In-store Merchandising, Retail Strategy and Retail Marketing" This is an area that EA rocks at. So with that in mind I hope this mean Nintendo consoles/games get more time on tv shows, internet, and store front for they need it. I could also see him making a campaign to make people know the wiiu is far greater then a wii. I can actually imagine the other Bowser actually standing outside that building like that. "Ugh, one of these days...Nintendo fans will bow down to me." I met a guy, when I was a child, who's name was Mario Bros (and he is Italian, by the way...). He was a friend of my Judo teacher. I think the fact that he's from EA is what we should be worried about. @bro2dragons Someone at NoA should make this happen! @rjejr I thought for sure it was going to be that Bowser. Nobody under 40 would know who he was, though. Sha Na Na FTW! Speaking of Scott Moffitt, I haven't heard much from him. Sure he wasn't as popular as Reggie and company, but I enjoyed seeing him. Will this help the amiibo situation? Guys, he's from Electronic Arts. They are practically the devil incarnate when it comes to the world of video games. If Nintendo lets him have his way he'll probably insist that the next Smash bros. only includes 8 characters out of the box, with the rest being $10 each for DLC ($8 if you own the character's Amiibo). The demo video that teaches you how to play the game will also likely be an additional $5, and all of the content released as DLC (over the 2 year period after the game releases) will be on the disc from day one. Thanks @Mercy_Lost and @RantingThespian I was afraid people were so distracted by his name that they'd forget to complain about him coming from EA. Your posts were the first I saw mention it. So? Reggie was a manager at Pizza Hut wasn't he? It doesn't really matter what he did, only how applicable the skills he picked up is to the job. Since he'll be in marketing and retail his experiences at P&G would actually be useful, and he won't be doing anything where his history with EA might be an issue. His "advantage" would be he's an experienced businessman, and new blood which Nintendo seriously needs. EA is actually really good in the areas he's being hired for, which NOA has been pretty poor at, its the other aspects of EA that are a problem. More often than not it's good to get someone from the "outside", keeps Nintendo from getting stuck in that bubble of theirs. And R'hllor only knows they barely have air to breathe in that thing as it is.